D2. Evaluate the tools and techniques used to create finished animations. 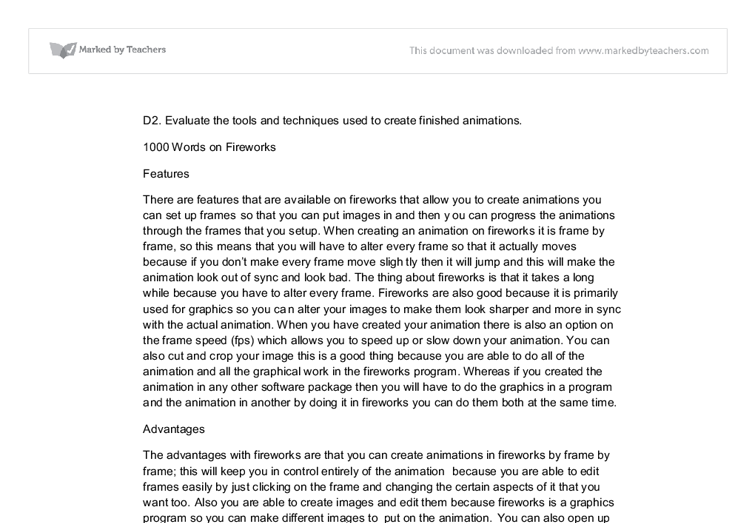 1000 Words on Fireworks Features There are features that are available on fireworks that allow you to create animations you can set up frames so that you can put images in and then you can progress the animations through the frames that you setup. When creating an animation on fireworks it is frame by frame, so this means that you will have to alter every frame so that it actually moves because if you don't make every frame move slightly then it will jump and this will make the animation look out of sync and look bad. The thing about fireworks is that it takes a long while because you have to alter every frame. Fireworks are also good because it is primarily used for graphics so you can alter your images to make them look sharper and more in sync with the actual animation. ...read more. This can be advantageous to you because you are able to see exactly how it would look if it was uploaded to the internet, so you can see the speed of the animation as its uploaded. There are also other advantages such as you can put sounds onto the animation so that when the animation is in play that you will have music or speech going whilst the animation is in motion. Another advantage with fireworks is when you create the animation and upload it on the internet that you don't need a plug-in too see the file in motion it will work without a plug in because the animation is not too much graphically enhanced. Limitations There are limitations for fireworks on the aspect of animations because it is not primarily an animation program, it is mainly/generally used to create and manipulate graphics. When you create an animation in fireworks a limitation is that you have to create an animation frame by frame, the problem with this is that it takes a long time to fully make and create an animation. ...read more. In Photoshop the animations that you create are generally very enhanced graphically because Photoshop is a program that is generally used for graphics and very powerful ones at that. Professional graphic designers will generally do there animations in Photoshop because Photoshop has allot more options that can be used for both graphics and animations. Photoshop is also the package that costs the most the newer version being CS4 costs in the range of �500 which is allot of money for a graphics/animation software creating program. Conclusion Overall I don't think that fireworks is a very good animation making program, everything just seems a little static to me, and there is not much going on. I prefer the flash animation over this because you are able to create animations allot faster than you can with the others. I believe that Photoshop is a very good animation program but it is hard to use. Really i don't think that fireworks is very good, it's ok for beginners to show them how animations work and how to create them but that's pretty much it. ...read more. This student written piece of work is one of many that can be found in our AS and A Level Management & Manipulation of Information section. ICT Solutions for people with Special Needs. Mind Manager supports this learning technique while also providing a powerful project management, presentation and organisation package for home and business users. 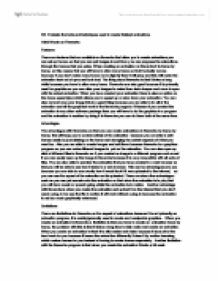 It costs around �50.00 Age range = 11 - Adult Time2Revise/Timely Reminders Organise and simplify revision techniques - Research by Ebbinghaus and others suggests that up to 80% of information learned is forgotten within a day. What the term Enterprise Resource Planning means and to whom. Edwards. Although they have been selling software for decades, they just went public one year ago. Since they launched their product, OneWorld open-systems ERP package, they have become a viable contender for a slot among the other big 4 vendors. Video World Database as ICT project. The computer on which Mr Lane will operate within Video World is a Windows 98 system and the workstation has a specification of a 500 MHz processor with 128 MB RAM and 32 MB graphics cards. He has a Microsoft Office 97 professional suite that includes Microsoft Word, Access, Excel, Publisher and PowerPoint. There isn't really a constraint for money; a maximum of �25,000 is available. The company recommends me not to spend all of it as they are running on a tight budget. The �25,000 will be inclusive of hardware and software. Using the Internet to research UFOs. Unfortunately, my efforts were shot down. Though I did find many places on the Internet that allowed for chats related to UFO?s and alien abductions, I had absolutely no luck joining any of them. I found that I needed to have Java to be able to participate in a few of these online discussions. User skills and how they affect the design of my DVD database.